Rain caused some problems in the San Francisco Bay Area Friday into Saturday morning including the lost of power to thousands of San Francisco residents. The "Pineapple Express" prompted weather alerts, preparations for potential flooding and preparations for the homeless. 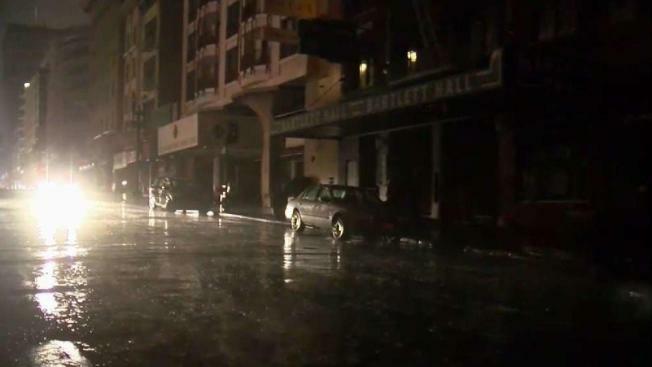 More than 10,000 customers were without power after midnight in the Lower Nob Hill and Union Square areas of San Francisco. PG&E said it was due to an underground equipment failure, but the company restored the power to all residents around 4:23 a.m., PG&E said on Twitter. Across the Bay Area, a few hundred PG&E customers were without power as of Saturday afternoon, according to the company's outage map. All of the flood watches and advisories were dropped by Saturday afternoon except a flood watch for Solano County. View full weather alerts here. A flood watch is in effect through Saturday morning for the North Bay and Santa Cruz Mountains, weather officials said. Bob Redell Reports. Bodega Bay in Sonoma County received nearly 6 inches (15.2 centimeters) of rain — more than the entire rainfall total for March, according to the weather service. County officials said there were no major mudslides in areas stripped bare by last fall's wildfires. To the north, state officials warned this week that they may have to use the partially rebuilt spillway at Oroville Dam for the first time since repairs began on the badly damaged structure last summer. The water level in Lake Oroville hit 796 feet (243 meters) on Saturday. If it reaches about 830 feet (253 meters), water managers said they may open the gates to the spillway. Officials said they are confident it can safely function. 'Pineapple Express' to Bring Rain Again; But What Is It? Earlier Friday, rain and wind caused flooding, closed roads and caused flight delays and cancellations at San Francisco International Airport. In Sonoma County, flooding caused traffic problems at state Highway 121 and state Highway 12. The Rohnert Park Expressway in Rohnert Park was closed between the Rancho Verde Mobile Home Park and Stony Point Road due to flooding, city officials said. Flight cancellations at San Francisco International Airport totaled 147 Friday, which was about 10 percent of the airport's total flight schedule, according to Doug Yakel, a spokesman for the airport. Most cancellations were on short-haul flights along the West Coast and delays were averaging 60 to 70 minutes in the afternoon, Yakel said. The heaviest rain in areas outside of the North Bay occured overnight. But by midday Saturday most places were dry as the Pineapple Express moved futher south. In Oakland, officials offered the public free sandbags and tips for storm preparation for Oakland residents. The city provided up to 10 free sandbags per household to residents and businesses, and up to 20 feet of free plastic sheeting per household while supplies last. The materials will be available 24 hours a day through Sunday, according to the city. Proof of Oakland residence is required. The materials can be picked up at the Municipal Service Center at 7101 Edgewater Drive or the Drainage Services Facility at 5921 Shepherd. The city has asked residents to check the storm drain near their home and use a rake to keep it clear of debris. It's also a good idea to check that backflow prevention devices on sewer laterals are functioning properly, city officials said. 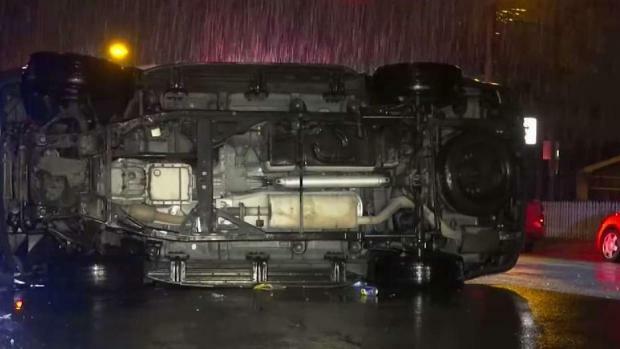 Morderate to heavy rain caused a few traffic accidents overnight Friday into Saturday morning. In Santa Clara County, additional shelter beds are available after the Office of Supportive Housing announced an Inclement Weather Episode, which started this evening and ends Sunday morning, according to county officials. The supportive housing division has also opened up 297 additional beds due to the weather. These beds will be available at the Bill Wilson Center, City Team Ministries, HomeFirst's Boccardo Reception Center, the Gilroy Armory, LifeMoves Georgia Travis House, Montgomery Street Inn and Project WeHOPE. The bulk of these shelters are located in San Jose with the exception of the Gilroy Armory and Project WeHOPE, located in East Palo Alto.